Benedictine Daily Prayer provides an everyday edition of the Divine Office for people who desire to pray with the church in a simple manner. Based on fifteen hundred years of liturgical prayer within the Benedictine monastic tradition, Benedictine Daily Prayer offers a rich diet of classic office hymnody, psalmody, and Scripture. Benedictine Daily Prayer is designed for all who pray in the monastic tradition including Benedictine oblates and Benedictine monastics. Small enough to fit in a briefcase for travel, it is arranged by date. Scripture readings are from the NRSV. Maxwell E. Johnson, PhD, is an oblate of Saint John's Abbey, Collegeville, Minnesota, and an ordained pastor in the Evangelical Lutheran Church in America. He is professor of liturgy at the University of Notre Dame. His articles have appeared frequently in Worship. He is the author of Living Water, Sealing Spirit; The Rites of Christian Initiation; Between Memory and Hope; and Praying and Believing in Early Christiantity published by Liturgical Press. "Benedictine Prayer offers a resource for a Benedictine way of praying the hours which draws on both a rich tradition and on a lengthy experience of responding to pastoral needs since the 1940's. It will be particularly suitable for those who wish to pray the office outside the monastery but it will also be a helpful resource for any monastic communities who work to re‐shape their own celebrations of the Work of God." 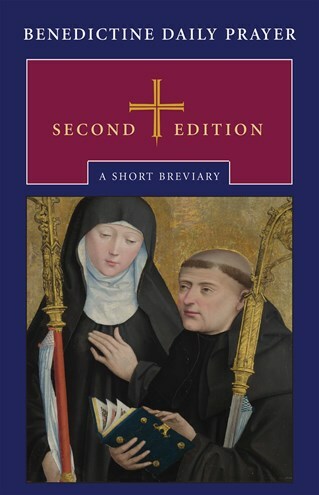 "I loved this breviary. The jewel of the hours in this prayer book is Vigils. Indeed, this is a great prayer book." "Between the two covers there is a rich treasury for praying an abridged monastic Liturgy of the Hours so that those who use it can enter into the daily rhythm of prayer that is at the heart of monastic life." "Anyone who desires to pray Christian daily prayer offices will welcome this fresh revision of Benedictine Daily Prayer. Much easier to use with less turning of pages, a generous selection of psalmody, additional readings from patristic sources for all three years, arranged in two-week cycles-all these features make this a more accessible and rich resource for a wide ecumenical company of prayer. Indispensable to daily spiritual practice." "Everything you need to pray the monastic Liturgy of the Hours is here between two covers. If you are traveling, praying alone, or simply looking for patristic readings to enrich your lectio, this book will satisfy. It is both user-friendly and rich in resources. The Press has given us a truly liturgical treasure."